The straight Malaysian virgin hair extensions are always easier to manage and are often used by working ladies, however the Malaysian virgin hair extensions if not properly handled and managed might just get frizzy. In the incident where they end up in small tight curls, don’t panic. Here is a step by step guide of how to straighten your virgin hair and return it to its former glory with no stress at all. 1.A hair brush is an important tool for this process. Take one and begin detangling your hair by gradually brushing through all the knots from the roots of your hair right down to the tip. Remember to do this carefully. 2.Next, wash your virgin hair. Get a good shampoo and conditioner for this. 3.You can’t work with your hair dripping wet, so get rid of the excess water. You don’t as well need the hair to be perfectly dry. you can use a towel for this step. 4.Begin to straighten out the roots of your virgin hair. To do this, pack all your hair to the back and form a tight ponytail with it. Comb through the hair beginning from the roots, right down to the tips till every strand is smooth. Leave the hair that way for an hour. 5.Now the hour is gone. Part your hair perfectly and ensure no tangles are present. 6.Pick one inch of your hair from the nape of your neck region. Begin combing it using a fine tooth comb. Wrap the part of the hair just worked on around your head. Make sure it is close to the crown area. You can use head band effect as a guide. Then hold the hair in place with a bobby pin. Do the same thing for the other part of your hair. 7.When this is done, grab a scarf and neatly wrap your hair in it. Then go to bed for a minimum of five hours. This would enable the hair to set perfectly. 8.At the end of the five hours, loosen your scarf and remove all the bobby pins. 9.Your hair at this point should be straight as new with zero tangles. Begin combing it through using a paddle brush. 10.Here you have it, enjoy your impressive outcome and rock that hair! Remember, when you decide to have that Malaysian hair straightened, do it a day before to ensure it works and you have your desired results. This would also be conducive for your stage seven in your hair straightening process. Such a helpful article?? Thanks sweetsunshineblog!!!! Worth reading? Thank You For reading Sanya ! These are some helpful points mentioned! Thanks for this detailed post, worth reading. This is a very interesting technique, worth a try. Nice techniques. Love the article. Thanks for sharing. This is an innovative idea will surely try it. for maintaining Malayasian hairs. Oh, I never even thought of the pain it would take in straightening up the frizzy hair. thanks for this post for such an easy explanation. Thanks for these great tips. Frizzy hair are tough to tame. A really nice read. Love it absolutely. Thanks for sharing this article ? Interesting and helpful technique I must say. Worth reading. That’s such an interesting technique .. I like the first pic .. so funny.. Loved this method a lot.. Never tried it.. Surely do it coming sunday. Wow Awesome steps to straighten frizzy Malaysian Virgin Hair ? Amazing and beautiful post. 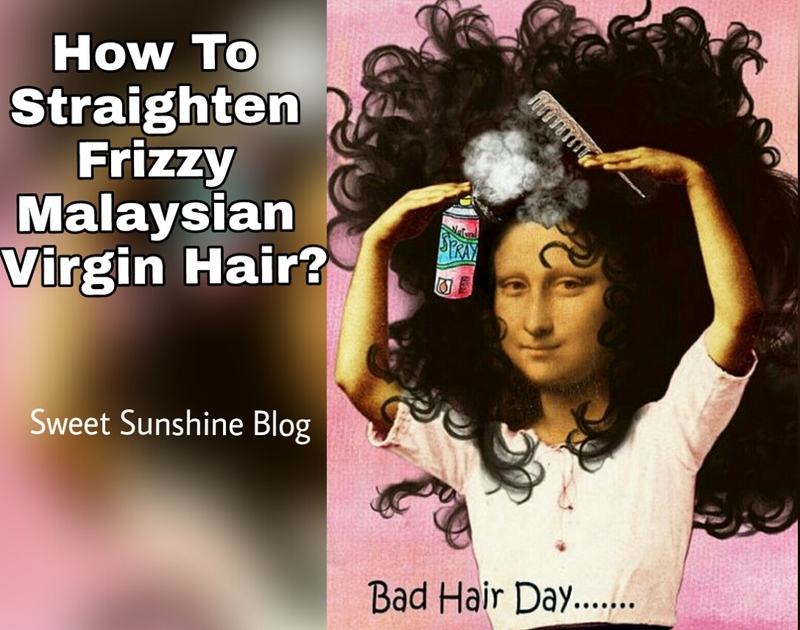 Very useful and beneficial tips to get rid of malayasian frizzy hair. Great thought.